Bringing soul to New England with curry flavored harmonics and an island girl visage is C.Dzen (pronounced "Season"), the Northern Nightingale. 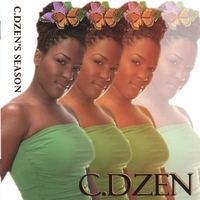 Get the album, C.Dzen's Season now. Eclectic, Chic, Soulful. C.Dzen (pronounced “Season”), known as “The Northern Nightingale” started singing at the tender age of six. Although C.Dzen was born and raised in Hartford, CT, her ancestry stems from Cameroon, West Africa and Jamaica, West Indies. C.Dzen began singing professionally during high school as a cantor for her church, in weddings, talent showcases, balls and community events. After graduating from Howard University on May 8, 2004 with a Bachelor of Business Administration in International Business – Marketing, C.Dzen honed her technical skills as a musical engineer at Full Sail: Real World Education in Winter Park, FL. Aside from her vocal talents, C.Dzen is also a motivational speaker, songwriter and spoken word artist. She is the ultimate “Quadruple Threat!” C.Dzen’s debut album, entitled “C.Dzen’s Season,” is an 18-track collection of songs that explore life, purpose, relationships & strength. As a registered BMI songwriter and publisher, C.Dzen wrote the majority of the songs on her album and co-produced more than half of the musical compositions behind the music as well. As a motivational speaker, C.Dzen shares her messages of self-esteem, self-empowerment, self-awareness and affirmative motivation to youth in schools, after-school programs and church youth groups across the nation. C.Dzen’s second album, “The C.Dzen of Empowerment Motivational CD,” is an expression of her mission to empower and uplift the youth of this nation.